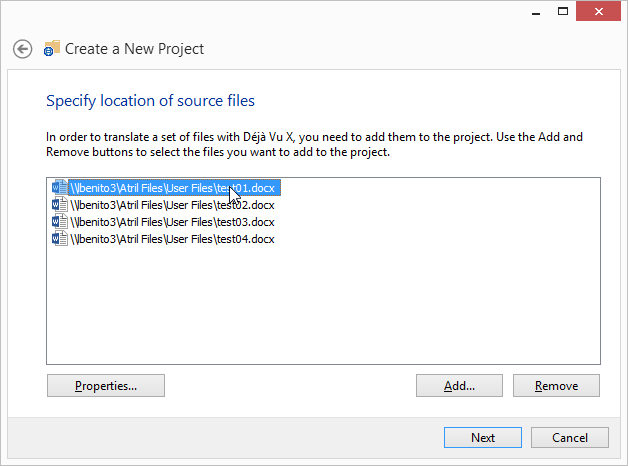 There are two ways to do this during the import process, depending on whether you are importing the file into an existing project, or using the Project Creation Wizard to create a new project. 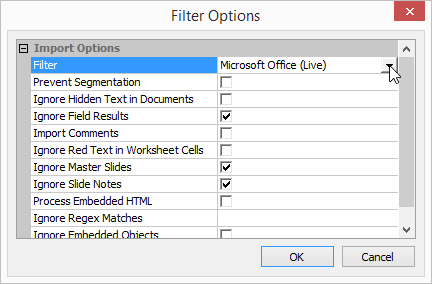 You can modify the filter options you want to use to import a document in the same page of the Wizard in which you specify what documents you want to import. When you are on the Specify Location of Source Files page of the wizard, and you have added one of more files, you will see that the button on the lower left-hand side of the Wizard window, labelled Properties, becomes active. 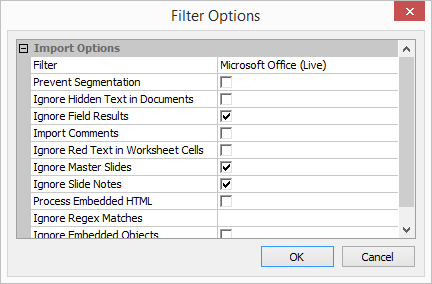 To change the filter options for one of the added files do the following, highlight the file you want to change the options for by clicking on it. Click on Properties..., and the Filter Options dialog will appear. 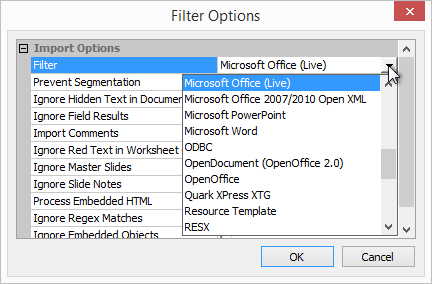 In this example, you can see the available filter options for a .docx file, and you can see that the Microsoft Office Live filter is being used. There are several different ways you can interact with these options. The easiest options to change are those that have check-boxes next to them. You can just click on them to turn them on and off. Doing this will cause a list to appear, and you can then scroll through the list to see all the available ones, and click on one of the items to select it. There are also fields in which you can type something to affect how the filter will work. 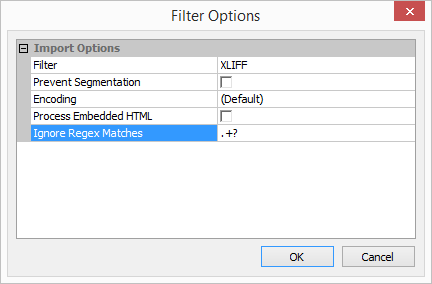 below, you can see the Filter Options dialog for an XLIFF document, which check-boxes and lists like we have seen before, and also a field you can type into, called Ignore Regex Matches. To change this field, click on the right-hand side of the field and, when you see the cursor flashing, you can begin typing. When you are done, click OK to accept the changes, or Cancel to undo ignore them. If you are adding a file to an existing project, you can simply use the Filter Properties window inside the main Déjà Vu window to change the filter options. This is explained in more detail in this article. As that article notes, if you have already imported the document into the project before modifying the filter options for it, you must import the document again, so that the document will be imported with the newly set options. 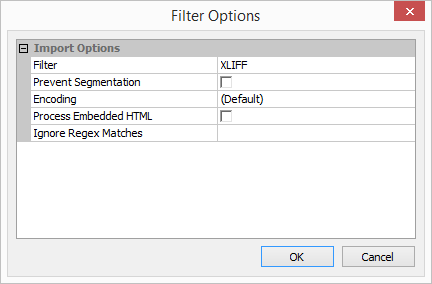 Simply changing the filter options without doing anything else will have no effect.